Located on Pittsburgh's North Shore, the Andy Warhol Museum is the largest museum in North America honoring a single artist's work. The Warhol's North Shore facility dates back to 1911, when it housed a distribution center for milling and mining products. Plans for a museum highlighting the works of Pittsburgh native Andy Warhol, internationally known as a leading figure in the pop art movement, were announced in 1989, shortly following Warhol's death. The 88,000-square-foot distribution center facility was reimagined by architect Richard Gluckman to encompass seven floors of gallery space and a basement-level conservation lab and education studio, opening to the public on May 13, 1994. The museum marks a collaboration between Pittsburgh's Carnegie Institute, the Dia Art Foundation, and the Andy Warhol Foundation for the Visual Arts. The AWFVA is credited with donating more than 3,000 of Warhol's works to the museum, including the entire catalogue of his film and video work. Along with the Carnegie Museums of Art and Natural History and the Carnegie Science Center, the Warhol is one of four Carnegie Museums of Pittsburgh, the city's largest museum association. The Warhol contains 17 galleries across its seven floors, housing an impressive collection of Warhol's multidisciplinary works. The museum's holdings are the largest collection of the artist's works and archival materials, encompassing the entirety of his career, from student work to notable pieces of the Pop Art movement. A film and video collection contains the entire body of Warhol's work in video, including 350 films and an archive of more than 4,000 videotapes. The museum acquired the rights to Warhol's entire video and film copyright catalogue in 1997 as a donation by the AWVFA. Visitors can watch Warhol's works in a viewing station exhibit, including all episodes of his television series Andy Warhol's TV, Andy Warhol's Fifteen Minutes, and Fashion. An extensive art collection includes 4,000 photographs, 2,000 works on paper, 1,000 published prints, 900 paintings, and 100 sculptures by the artist. Highlights include his 1960s consumer product paintings, including his famous Campbell's Soup Can series, and his celebrity portraits of Elizabeth Taylor, Marilyn Monroe, Elvis Presley, and Jacqueline Kennedy. Later collaborations with artists such as Jean-Michel Basquiat are also on display, as are sketches by Warhol's mother, Julia Warhola. Half a million items are contained in the museum's archive collection, chronicling the artist's life alongside his work. The highlight of the collection is Warhol's serial Time Capsules, a 610-piece compilation of ephemera from the artist's daily life, including source images for his work, personal correspondence, and fan letters. A nearly complete series of his Interview magazine is on display alongside a number of personal items, including personal clothing and wig pieces. Nearly 4,000 audio recordings of conversations between Warhol and his artistic peers and associates are also available for listening. A cafe, Warhol-themed store, and kids' play area are also featured at the museum. In addition to its permanent collection at its Pittsburgh facility, the museum has presented 56 touring exhibits to over nine million viewers, showcased in 153 worldwide venues over the past two decades. The Warhol is one of four museums comprising the Spalding Gray Award consortium. Along with the Walker Art Center, On the Boards, and Performance Space 122, the consortium commissions yearly works by multidisciplinary artists and performers showing fearless innovation in their fields. Collaborations with local arts organizations include Pop Cabaret, a biannual performance by Carnegie Mellon University art students. Extensive public programming serves to both contextualize the museum's collections and collaborate with the Pittsburgh arts community. The popular Sound Series features concerts from notable international touring musicians, and the Warhol for All program presents experimental theater and other contemporary arts performances. 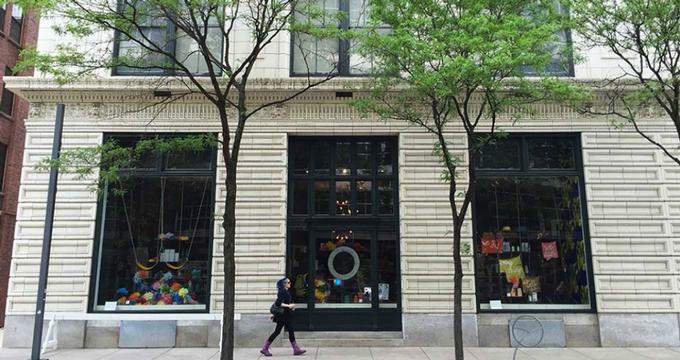 Rising artists from the Pittsburgh community are featured in the Exposures series, which places installations in the museum's street-facing windows as an homage to Warhol's career beginnings as a window dresser. The museum also partners with the Homeless Children's Education Fund and Highmark Caring Place to bring therapeutic, hands-on programming to area underprivileged and grieving families. The Warhol is committed to honoring its namesake's role as a queer icon, embracing LGBTQ+ culture and partnering with local organizations to present programming highlighting the queer community. An annual LGBTQ+ Youth Prom is one of the few of its kind in the region, offering a safe, gender-inclusive space for queer youth to celebrate the high school rite of passage. An annual spring Youth Invasion also serves as a local youth celebration, designed by and for area teenagers.